* NB: This article is not meant to make you envious or depressed. If you think you might not be able to handle talk of tropical beaches, sunshine, and warm climates, please don’t read on. This is about the reality of working under such conditions, and how it’s somewhat removed from the blissful existence one might imagine. 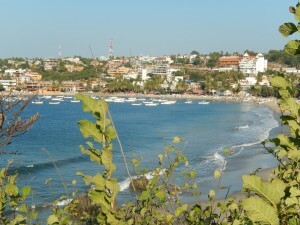 Playa Carrizalillo, Puerto Escondido, Mexico. For a dozen years, one of my biggest career dreams has been to edit book manuscripts on a beach beneath sunny, tropical skies, palm trees, and palapas, maybe swinging in a hammock. Well, this winter I’ve had the opportunity to do just that. In mid-January, my husband and I left Canada’s harsh winter climate for a six-week tropical getaway to southern Mexico. He’s retired and the snowbird lifestyle appeals to him, and my work is not location dependent, so our plans seemed ideal for me to combine some adventures in Mexico while still working part-time. After all, last year we spent two months in Palm Springs and Phoenix, Arizona, and I had no trouble with keeping up with my work deadlines. So I held to my dream that as soon as I found that perfect beach and palapa, I’d be in editing bliss. I already have a perfect job; what more could I want but the perfect environment in which to do it? And for me, perfect means tropical beaches. But temperate, moderately warm climates like Palm Springs are one thing. It’s relatively easy to stay focused on work while enjoying a few hours of hiking or lunching in town. However, a tropical vacation has turned out to be a little different from what my imagination had amply provided for so many years. There’s a lesson here: if you’re stuck in an office or suffering from the cold of Canadian or US or UK winters and are dreaming of working in a tropical locale, be careful what you wish for. When your dream comes true, it may not be everything you imagined it would be. Just as with many things, the reality rarely lives up to the fantasy. 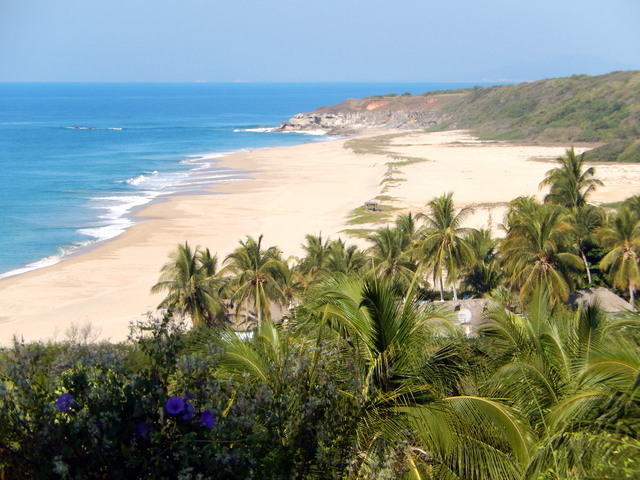 Our trip began with a one-month condo rental in the rustic, authentically Mexican beach town of Puerto Escondido, on the southern coastline of Mexico. 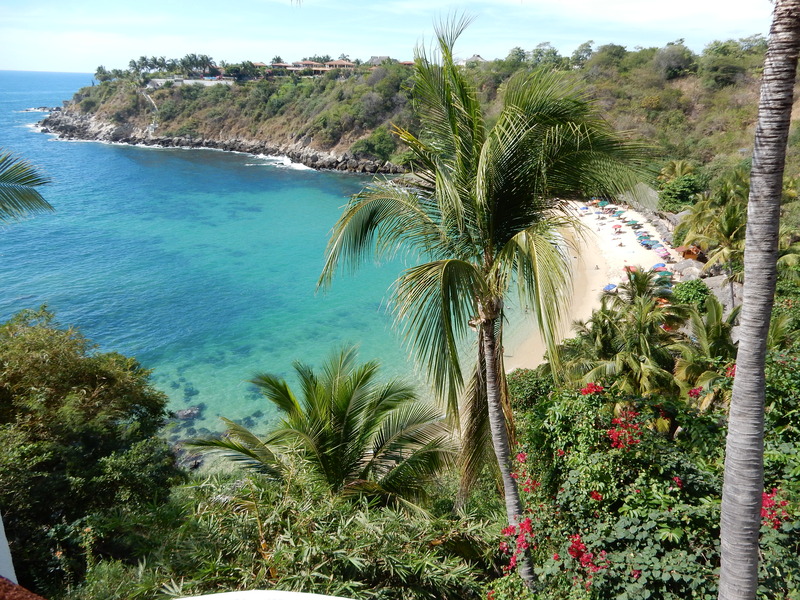 For the remaining two weeks, we’ve been in a lovely B&B and then a charming old-world-style hotel in nearby Huatulco, a more upscale, developed resort town with all-inclusive hotels and a cruise ship terminal. After spending a day or two getting our bearings in Puerto (as the locals call it), I tried to settle into a part-time editing routine: morning walk, editing for a few hours, afternoons off for pool and beach, dinner, and then a few more hours of work later in the evening. But it didn’t take long for that schedule to begin crumbling. Here are some of the reasons. Many Mexican towns have relatively low bandwidth compared to what we’re used to in Canada. As well, cement and cinderblock walls are the main methods of construction in Mexico. These provide a cheap, effective way to build a home and keep it cool, since many homes often lack air conditioning and only use fans. (Wood construction rapidly deteriorates in the salt air and humidity.) But these thick walls are often the biggest impediment to attaining stable, reliable wireless Internet. Wireless signals can’t effectively penetrate the thick concrete walls. At first I thought that poor Internet connection was only in Puerto Escondido, which has fewer conveniences than touristy Huatulco. 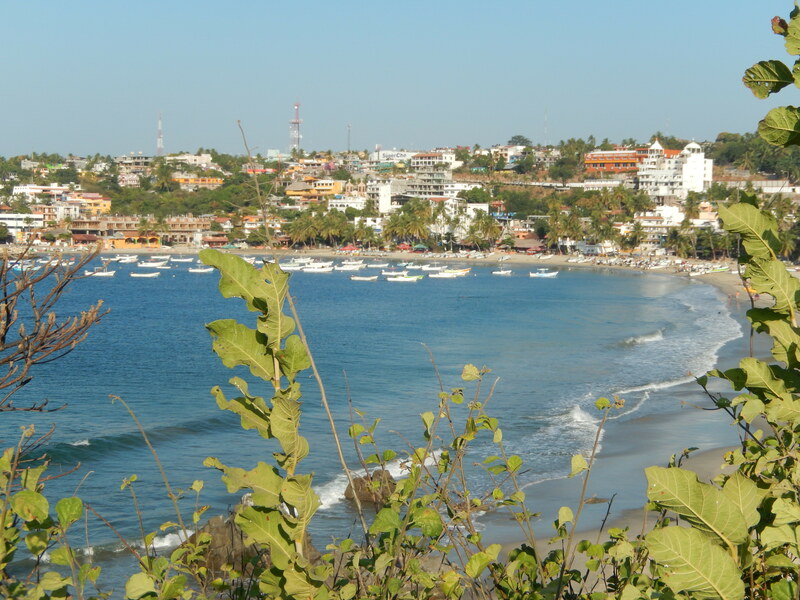 But even in Huatulco, the connection is slow or disappears for long minutes at a time and the signal is annoyingly intermittent, forcing one to move outdoors, into a shady spot. Finally I can begin working, but unless there’s a power outlet or a very long extension cord handy, I have only about an hour and a half until my battery runs out. To make things more difficult, even in the shade my image reflects back at me in the computer screen, interfering with the text and making me squint. Which brings me to . . .
A smaller computer would make her even happier. I knew bringing a seven-pound laptop would be a nuisance, but without buying something new, I didn’t have much of a choice. Sure enough, the monster has turned out to be too cumbersome. When I posted this photo on Facebook, I was teased about the size of my laptop. I’ll be downsizing to a tablet for the next trip, providing fewer laughs but greater productivity. Two other problems have been screen visibility, as noted above, and dust and sand in the keyboard. When editing outdoors, even in the shade, a matte screen is essential. At home I have one, but on this trip we brought the older computer with a glossy screen. On my next trip, my new tablet will have an anti-glare cover for the screen and perhaps a dust cover for the keyboard. And a good six hours of battery life, not one and a half. The heat in southern Mexico is much more debilitating than I’d imagined. I’ve always hated cold and loved warmer climates, but as I get older I have increasing trouble functioning well in anything much above about 32° Celsius (89.6° F.). While here in Puerto and Huatulco the temperature is consistently around 30°, the humidity makes it feel eight or ten degrees hotter. We’re talking almost 100° F. And you can imagine that’s not comfortable to work in unless you’re sitting in a breeze, beneath a fan, or in an air-conditioned room (I usually manage to find one of the three). This constant humidity/high temperature combination is a real drag on energy, and it’s not something I’d counted on. 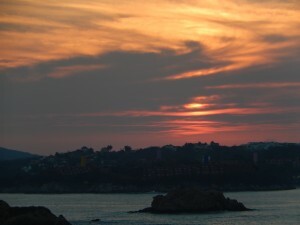 Sunset over Tangalunda Bay, Huatulco, Mexico. Besides the usual holiday distractions—shopping, exploring, dining, tours, and excursions—there were a few I hadn’t anticipated that interfered with my work productivity. The aforementioned spectacular views and beaches. They’re everywhere, unavoidable and alluring, and once they draw you in, it’s hard to disengage yourself. In addition, sunset watching is a regular activity down here, which zaps another half hour or more from your day, especially if you join all the other sunset watchers for a margarita at Puerto’s Sunset Bar. Everyone is looking for the elusive green blip. Facebook. I spend at least an hour or more on Facebook every day at home—time I can afford, chatting mostly with other editors. However, here, I can’t afford that luxury if I’m going to complete all my work. But even though I’m limiting my Facebook time, I have a hard time detaching myself from it entirely, especially when I’m posting vacation photos every few days. Invariably I find myself on there for longer than I budgeted. Socializing. Going out to the pool patio isn’t usually a solitary endeavour. Other vacationers are out here, mostly Canadians, many retired. Nobody else is thinking of work and everybody wants to socialize. It’s all too easy to get caught up in a conversation with some interesting person. Snorkelling. I’ve never snorkelled in a place with such a variety of exotic, brilliantly coloured fish. I love them! I simply must go snorkelling a few days a week, something I didn’t factor in when budgeting work time. Do not edit under palm trees. 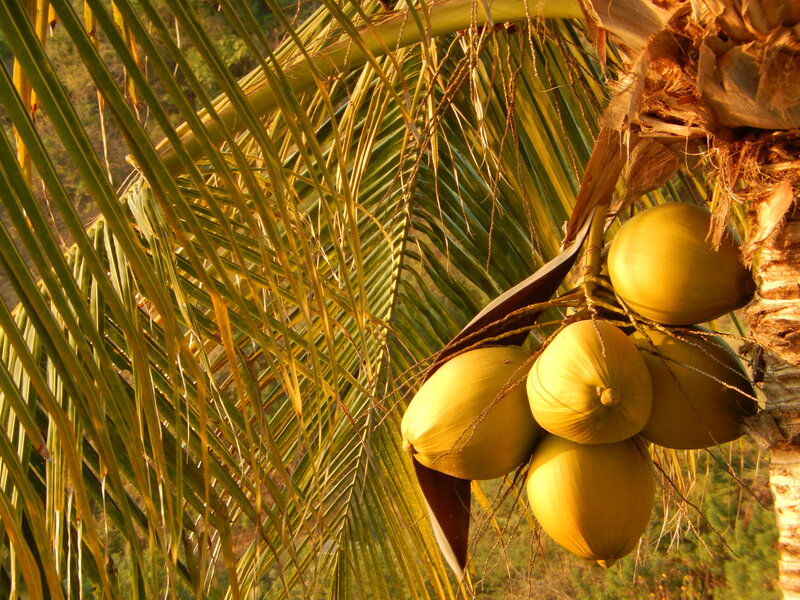 The other day, a huge coconut fell out of a palm tree from a great distance, landing just three feet in front of me as I strolled along a sidewalk. Yikes! A seriously close brush with disaster. 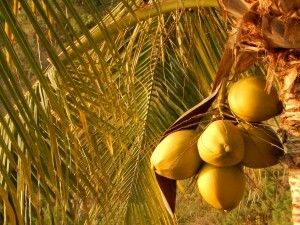 I came home and did some research and learned that death by coconut is a real hazard in the tropics. People are warned never to sit or fall asleep under a palm tree. So much for editing there. 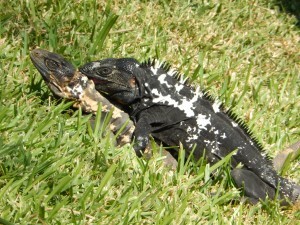 Iguanas fall out of palm trees regularly too. They scuttle up to the top then lose their grip and plummet; my husband witnessed this twice. Injury by iguana is real. In past years during freakishly frozen winters in Florida, iguanas froze in palm treetops, then fell out, causing car accidents and regaining life when they thawed. But I’m not likely to be in Florida during a freezing winter, so I guess I’m safe on that count. Other things fall out of trees too, like unripe almond fruits. One dropped on my husband’s head. All in all, for health and safety reasons, sitting under shady trees is best avoided. At the beach, wasps alight on the straw of your margarita. They find the nectar so sweet that they proceed to crawl down the straw, getting stuck therein. Unaware, you blissfully take a sip of your drink, and . . . This almost happened to me. Needless to say, if a hard-working editor were to swallow a wasp, her work for the next few hours would surely be impeded. The aforementioned heat. This can seriously get you down, even make you feel ill. It takes some getting used to. Clearly I must spend more time down here acclimatizing myself so I can become more productive at work. And don’t forget scorpions. The other morning, one of these little friends turned up in our kitchen sink, and my reaction is best left to your imagination. Not the best way to begin the work day, suffice to say. If nothing else, it was a reminder to always wear footwear in the tropics. This is perhaps the least expected and the most difficult thing to deal with. 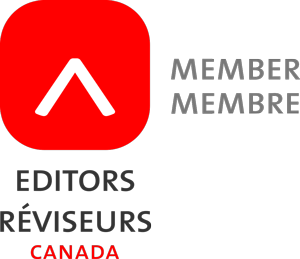 I am a disciplined editor. I began the trip obsessed in my usual way with checking my e-mail and getting in a few productive hours of work a day, despite the lure of splendid beaches, views, luxurious pool, iguanas, etc. But gradually I found it increasingly difficult to apply myself to work, even though I’d set time aside for it. Routine is important for work, and it’s hard to establish one in just a few weeks. 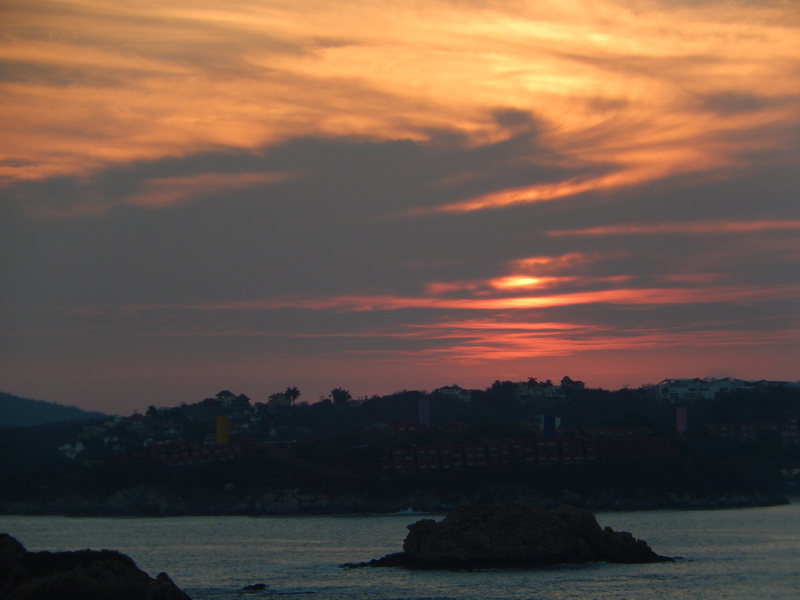 Just as I was finding a rhythm in Puerto, it was time to move to the B&B in Huatulco, where our one-week stay was too short to begin a new routine. Ditto with a hotel in Huatulco’s marina for five days. I knew I would need a lot of self-discipline with my near-addiction to Facebook. While I managed to maintain my distance fairly well, I still can’t seem to go even a day without lurking for at least a little while. On the whole, trying to fit in beach time, pool time, exploration time, shopping, dining, socializing, and Facebook with three or four hours of work daily is very difficult. Not to mention that heat, which only increases lethargy and lack of concentration. Fortunately, my innate self-discipline helped me to complete the work I had planned for the duration of our trip and even some extra small projects that came in. But next trip, I’ll need to summon even more. A new tablet computer and a new efficiency plan should help. The thought of leaving is depression-inducing. In a few days, I’ll return home to snow and minus 10° C. (14° F.) daytime temperatures. In a way, this may be harder to take than never having been away at all. I may fall into a serious funk. 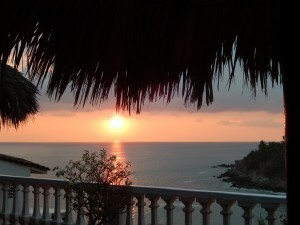 The only thing that will keep me going is the thought of summer—and coming back to Puerto and Huatulco next year. I love it that much. And a couple of great editing projects that will make life in my frozen Okanagan city much more palatable. 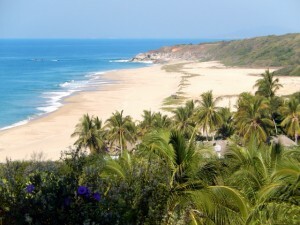 Bacocho Beach, Puerto Escondido, Mexico. Of course, these are hardly the worst problems an editor, writer, or anyone else could have while trying to work on vacation. But I’ve learned that my fantasy of a professional life editing beneath a palapa on a tropical beach just isn’t realistic, and I’ll plan my future trips to the tropics accordingly, with even more disciplined time in a cool room or under a covered patio with iguanas and palm trees a safe distance away. If it sounds as if I’m complaining, I’m certainly not. As they say, the worst day in paradise is better than a good day anywhere else. And sometimes the things we wish for do come true in unexpected ways. I can now envision buying a small home in the tropics at some point in the future, and then every day would be more “normal” and I’d fall into a regular rhythm of work. Now that would be paradise. And now, if only those fascinating, fornicating iguanas would take a break so I could tear myself away and get that margarita refill (virgin, of course—I’m working!) that’s awaiting me poolside. That will help my concentration. Except there’s that alluring view of the spectacularly beautiful Pacific, where hundreds of exotic fish await me on my next snorkel outing . . . Hilarious! Thanks for sharing your copyediting trials while travelling. I have a Surface RT, and it’s a nice stand-in for a laptop. It comes with an Office suite (lite) and a USB port into which you can plug a keyboard (or you can order the touch keyboard that comes with it, but it takes some getting used to).The Surface will give you the battery life you’re looking for. You might also check out the Surface Pro. For proofreading, a Kindle e-ink reader’s screen does well in direct sunlight. Thanks for the comment, Corina! I’m so glad you wrote to tell me about the Surface RT and Pro. Others have mentioned that this may be a good option for me. A cursory look suggests the RT model may be sufficient for my needs. And I would definitely need the physical keyboard. Would you call the Surface a tablet or a notebook? I’m still a bit confused about the difference between the two.